We took psychology together but, while I was dipping films in a chemical bath, she was studying drama – with Alan Davies, with whom I fell in love, unrequited, and draped myself around during the never-ending lunch breaks in the refectory. I could share my photos of him on social media now, but they’re old and faded; you can imagine how many fingerprints covered those proof sheets after he became famous! There was no social media of any kind back then – computers were for spacemen and PacMan. How different our lives might have been had not Winston raved about his Saturday job in Hamleys, encouraging us to sign up for weekend work selling balloons. There was a small computer department there at that time – yes, Pacman – also Aliens. No one was sure they’d take off…. After a year of unbelievable and unmentionable fun in the world’s best toy shop, I started my career in fashion while Nicky ventured off into the police. 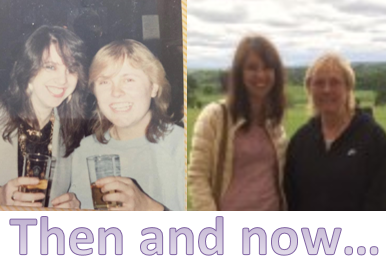 We kept in touch for a few years, partying with Marion, then our lives diverged and Nicky moved up to Newcastle. Friends Reunited brought us together in 2004 for a brief breakfast in Vegas but we hadn’t seen each other since then. So a Whatsapp call out of the blue led to this weekend of frolicking (as much as women of a certain age are able…) through our old stomping ground of London’s Regent Street and surrounding areas. 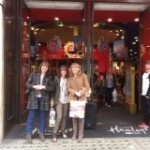 Gill joined us for our trip down memory lane – better known as Carnaby Street. It’s a buzzing, trendy area that’s never lost its charm, despite losing the psychedelic orange paving stones. 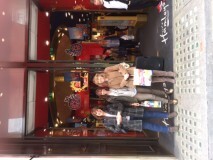 The hour we spent in Hamleys generated a lot of laughter. We didn’t realise at the time, but one of our old colleagues still works there – 38 years of service – how many people can beat that??! ‘Lunch’ was eight huge wedges of chocolate cake with a few dollops of ice cream and a generous squirt of sauce at Choccywoccydoodah – one of my favourite London cafés. We all shared nicely and brought home the remainder for Sunday’s afternoon tea. Never a truer word. Marion and I have worked together on and off for 33 years and she’s a fantastic asset to my business. Wishing her a very happy birthday today!! 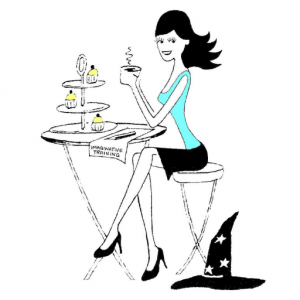 If you’d like to know what Marion does to keep our social media clients happy, ask me here: @WeekendWitch.